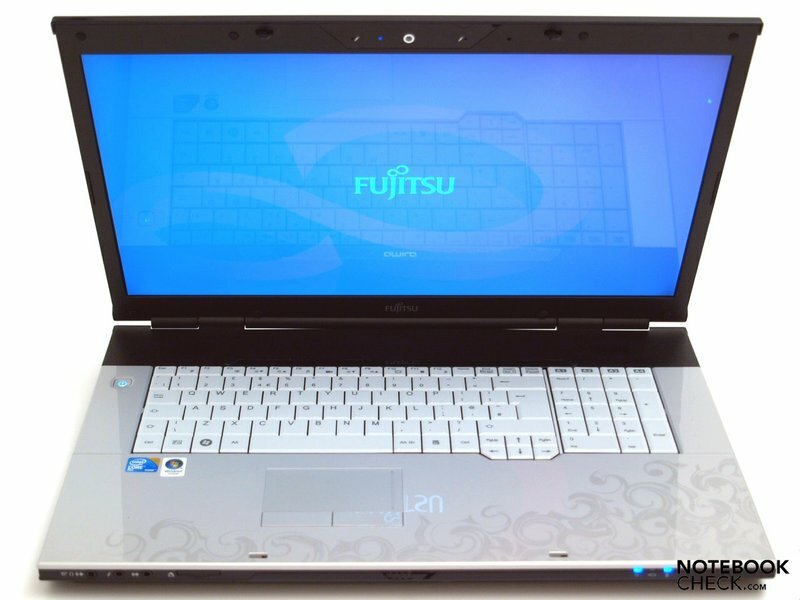 The Fujitsu Amilo Pi 3660 lines itself in among the desktop replacement devices with a size of 18.4 inches. 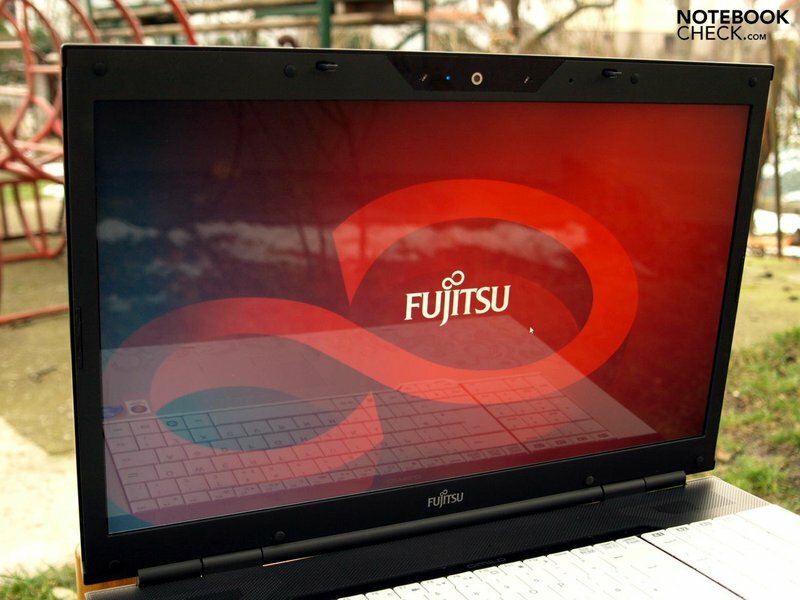 At the same time, Fujitsu positions it as an entertainer for the consumer market. 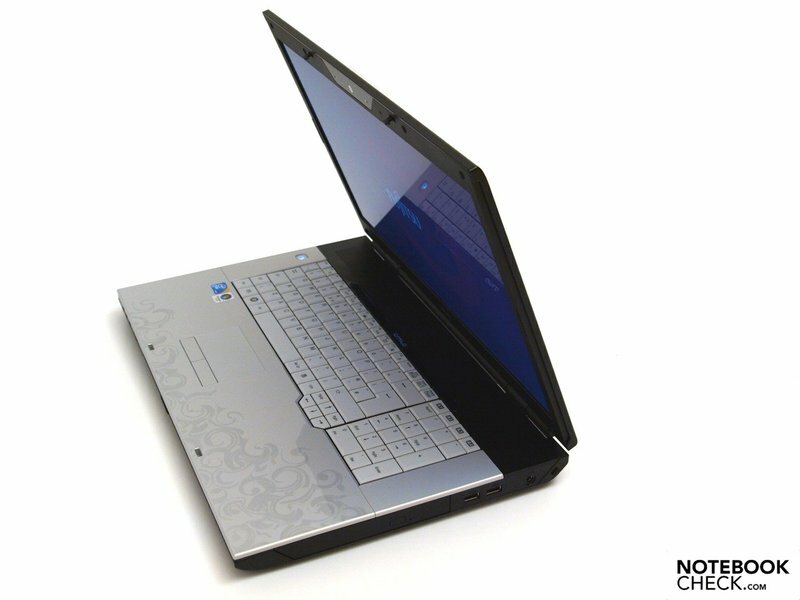 The large-size laptop tries to address them with an attractive design. But it doesn't only look elegant. Above this, its interiors promise a good application and graphic performance. In the following, we'll take a detailed look at the Amilo 3560's strengths and weaknesses. The Amilo Pi 3650 is heralded by Fujitsu under category of "all-rounders". 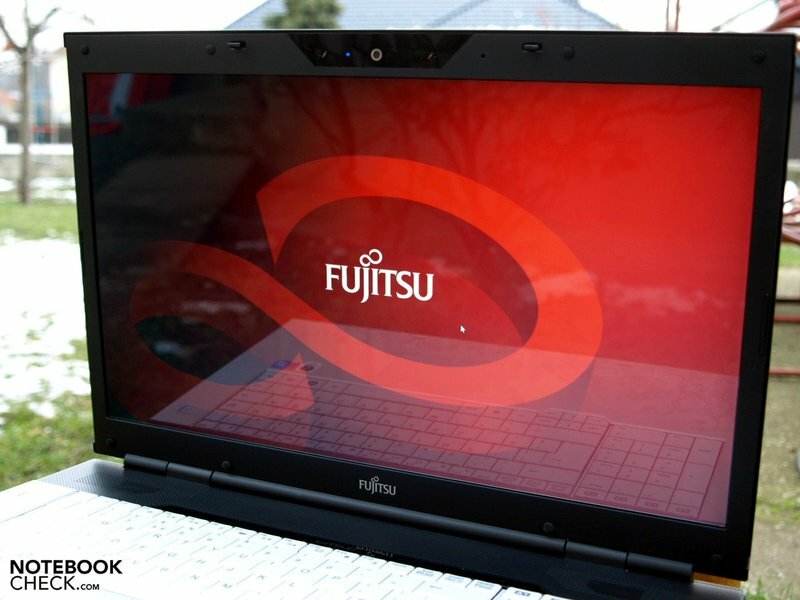 Aside from its little brother, the Pi 3560 in a 15.6 inch format, which we sent through our benchmark course in November, Fujitsu also lists the Lifebook A1130, a 15.6 inch devices with a GMA 4500M HD graphic chip set, and the LIFEBOOK P 3110, an 11.6 mini-notebook with potentially good communication components, in this group. Furthermore, both Amilo L range devices, Li 3910 (17 or 18.4 inch) and Li 2710 (15.6 or 16 inch) and the Esprimo Mobile V range are found there. 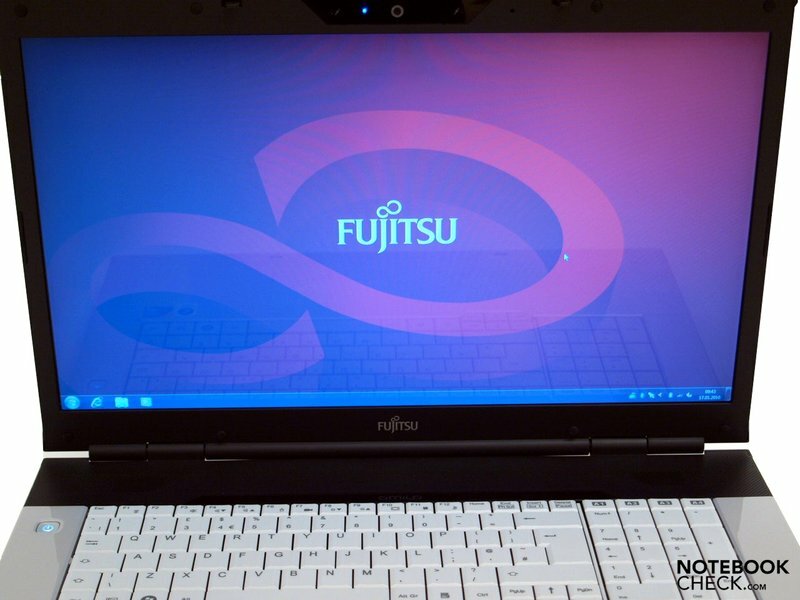 To be more precise, our 18.4 inch sized prototype is a Fujitsu Amilo Pi 3660 with the model number EF9A. 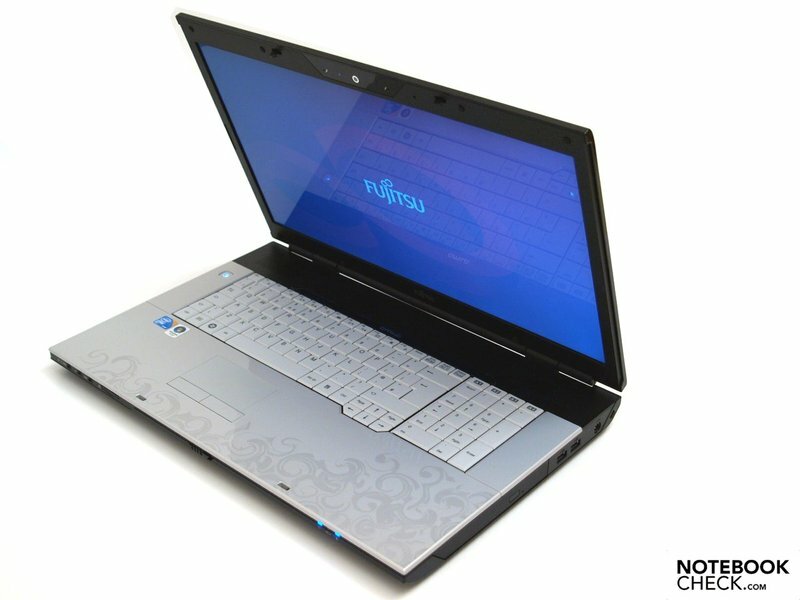 It's equipped with an Nvidia Geforce GT 240M graphic card, Intel Core 2 Duo T6600 processor and a four gigabyte RAM. Points that are strongly dependent on the interior life, this applies basically to performance and emissions aren't necessarily true for other models. In any case, it doesn't only look different than the equally sized Amilo Li3910, which has to be satisfied with an integrated graphic chip, a maximum of 4 gigabyte RAM, and Intel Pentium or Celeron processor, but also delimits itself with more efficient components. Apart from the size, the larger Pi 3660 doesn't differ much from the already tested Pi 3560. Again, you can see here that black high-gloss surfaces visibly and quickly get filthy. 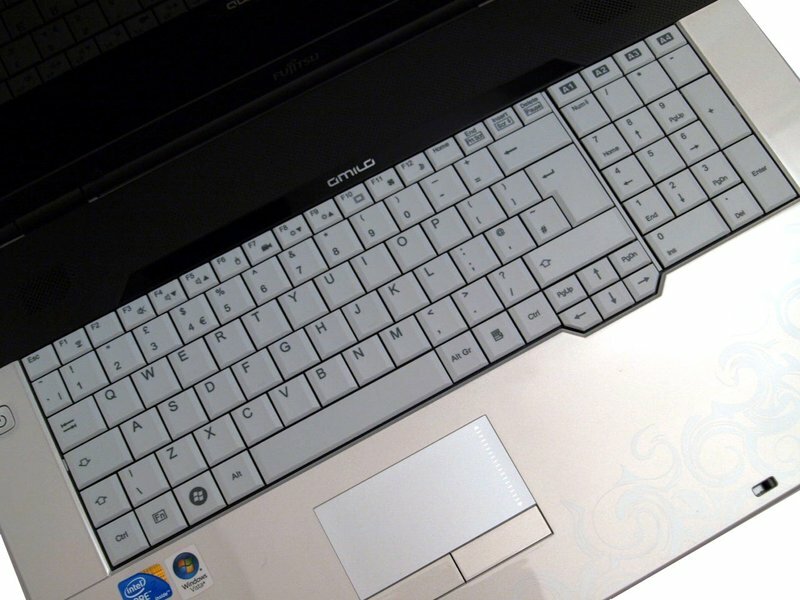 The pearl white (called "silver" by the manufacturer) patterned high-gloss surfaces on the wrist-rest and beside the keyboard are a bit more compliant in terms of this. It is, however, evidently much bigger and heavier than its little brother in 15.6 inches with an 18.4 inch display size, 440 millimeters width, 294 millimeters depth, 42 millimeters maximum height and almost 3.5 kilograms of weight including the battery plus an additional half a kilogram for the adapter, as would be expected. Admittedly, laptops of this size are rather more conceived for stationary use as a desktop replacement (DTR) so that this isn't as important. There's nothing to complain about in terms of the base unit's pressure stability and torsional stiffness. Contrarily, the case makes an overall stable and massive impression. 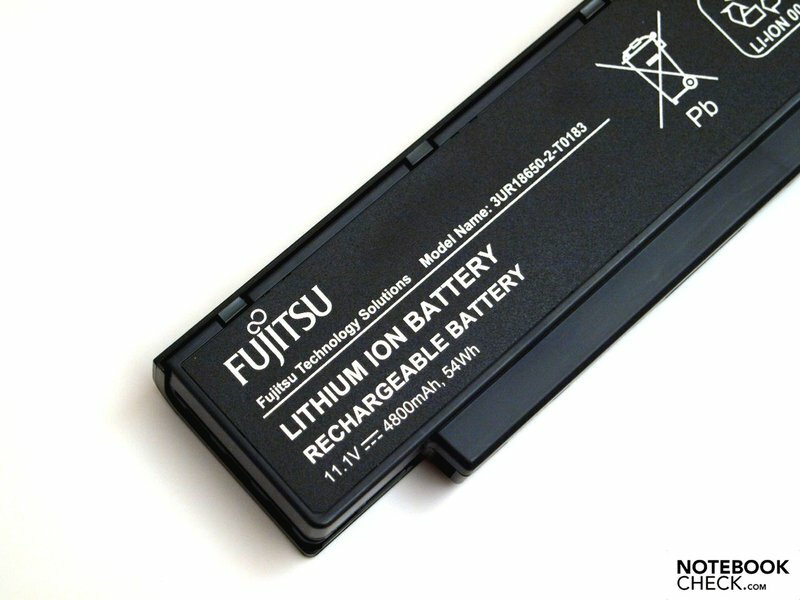 Unfortunately, the locked battery doesn't fit quite tight and can easily be moved back and forth in its compartment. The display lid can't respond as good to a singlehanded picking up at one corner, as for example the smaller Amilo Pi 3560 would, already because of its weight. However such maltreatment is rather improbable for a DTR device. Image distortions can be provoked on an activated screen by stronger selective pressure against the lid or even by not quite as much on the display bezel. The device has a double hook lock, which prevents the device from unintentionally opening during transportation and is also easy to unlock with a slider. 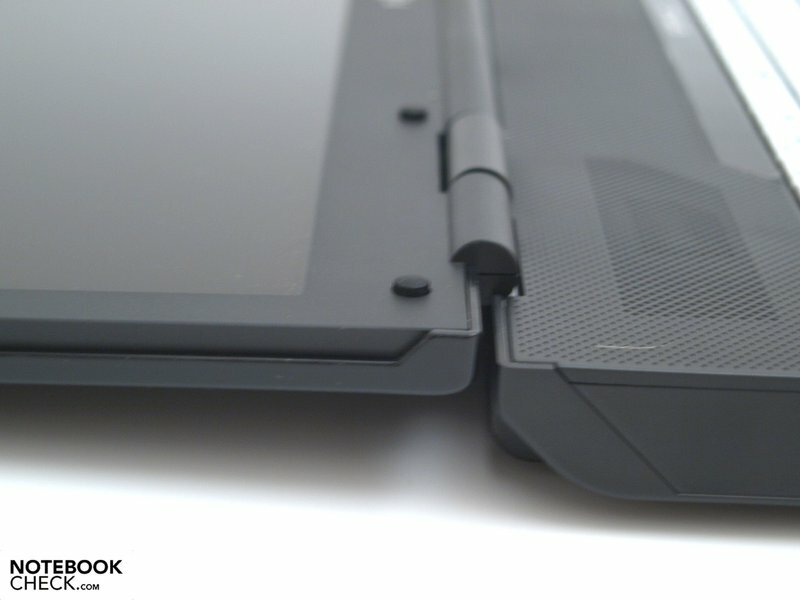 You can see an evident teetering after adjusting the opening angle and it's not advisable to work in an unsteady work environment, such as during a train trip, due to the display's evident vibrating, if you don't already refrain from that just because of its size and weight. In exchange, the screen can be opened a bit more than 180 degrees. Singlehanded closing isn't a problem, but you need a second hand to hold the base unit at opening. Basically, everything that you need for the use of a home entertainer or starter multimedia device is found on the 18.4 incher. 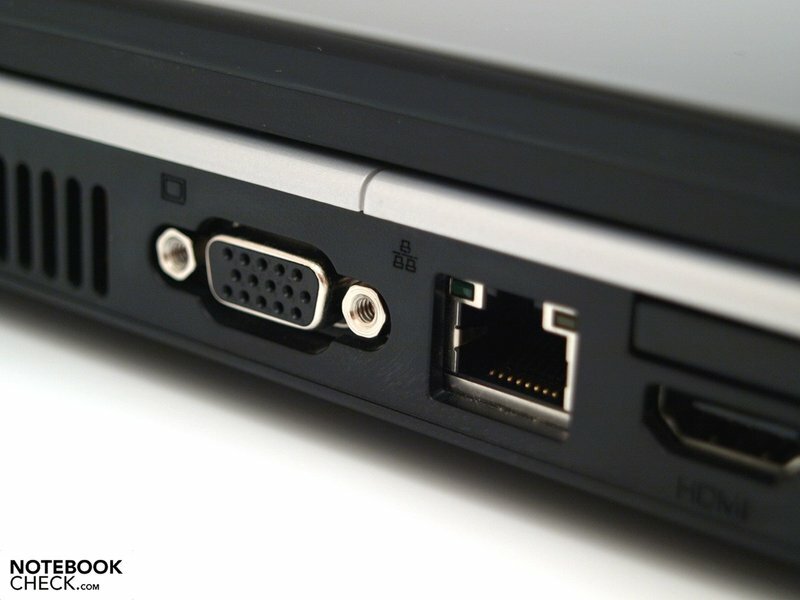 Aside from analog image transmission to an external monitor or projector, etc, via VGA, an HDMI connection makes a digital audio and image transmission possible, as well. 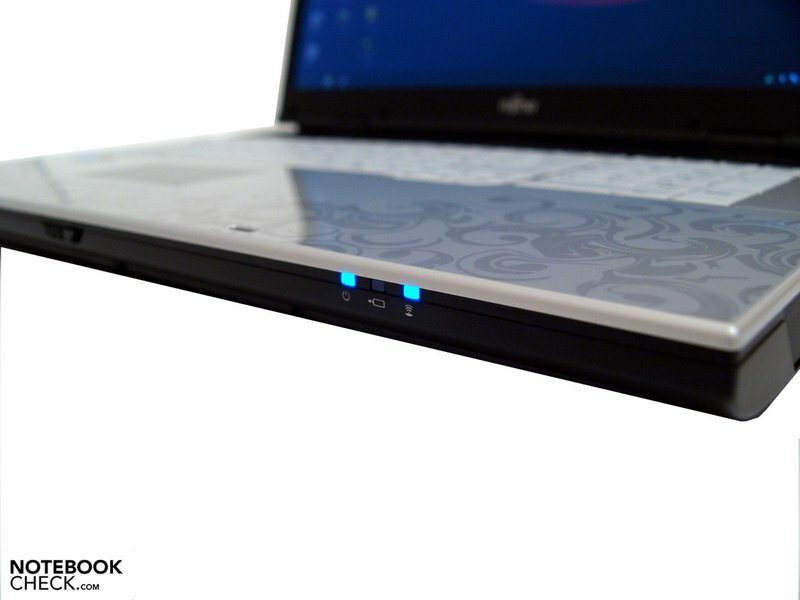 A 5-in-1 cardreader and an ExpressCard/54 slot for extending the function options are also onboard. The audio interfaces have, aside from the usual microphone and line-in also a headphone with S/PDIF support. In any case, more than only three USB ports, one as an eSATA/USB combination, would have found a place on such a large laptop, though. Whilst righties can work unimpeded by cables on their working side, lefties will likely have a hard time with the Pi 3660, depending on the use. 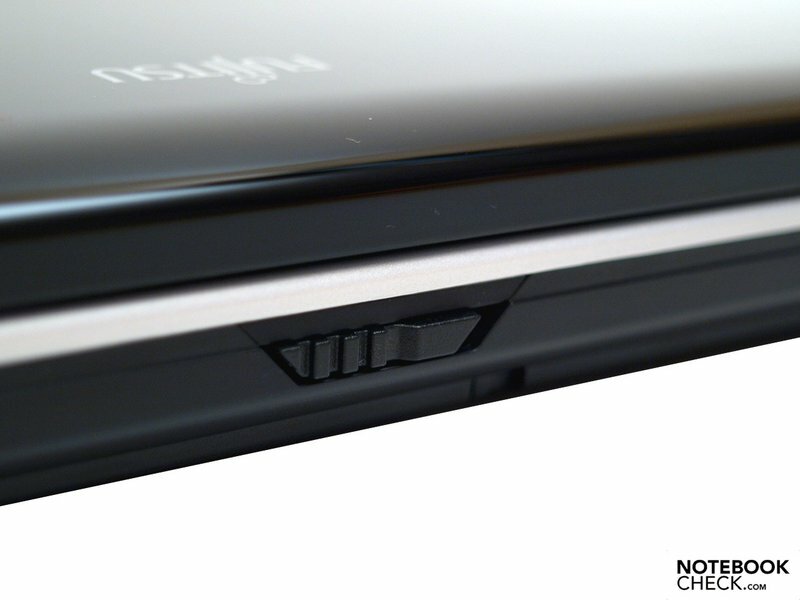 Both the VGA and the HDMI port are found separated by a RJ-45 port (LAN) on the left edge's center to front area. 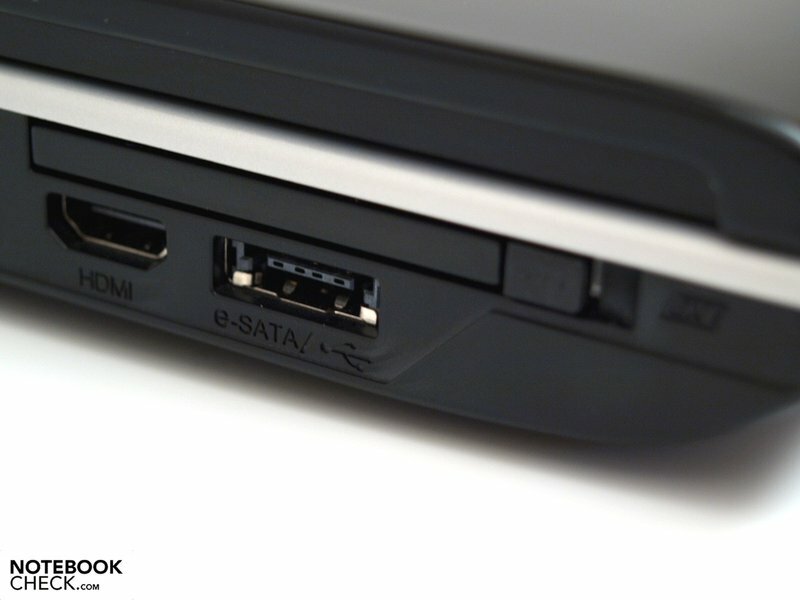 Additionally, the eSATA/USB combo port is on the left's far front. Cabled, a Realtek RTL8168D/8111D Family PCI-E GBE NIC allows the Pi 3660 to link to an Ethernet. Wireless communication is possible via a Ralink RT2790 WLAN module, which can use the fast draft-n in an appropriate infrastructure, on the one hand. On the other, data exchange with mobile end devices, such as mobile phones or PDAs, can be executed via Bluetooth 2.1. A good basis for video telephony is given with the 1.3 MP webcam, as well. 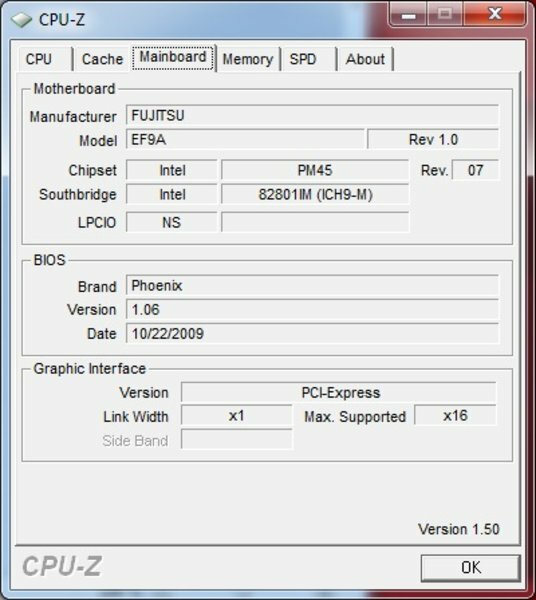 Although you would expect to meet a Vista version due to a sticker on the left wrist-rest, you'll actually find Windows 7 Home Premium in the 64 bit version. Therefore, the four gigabyte of physical RAM can be used efficiently. The system information informs us: 3.96 GB total real memory and therefore considerably more than it would have been possible with a 32 bit alternative. You can summarize the supplies with one word: Emptiness. Merely a battery and adapter had been included for our prototype. You look for a recovery data carrier, drivers or even a printed manual in vain. 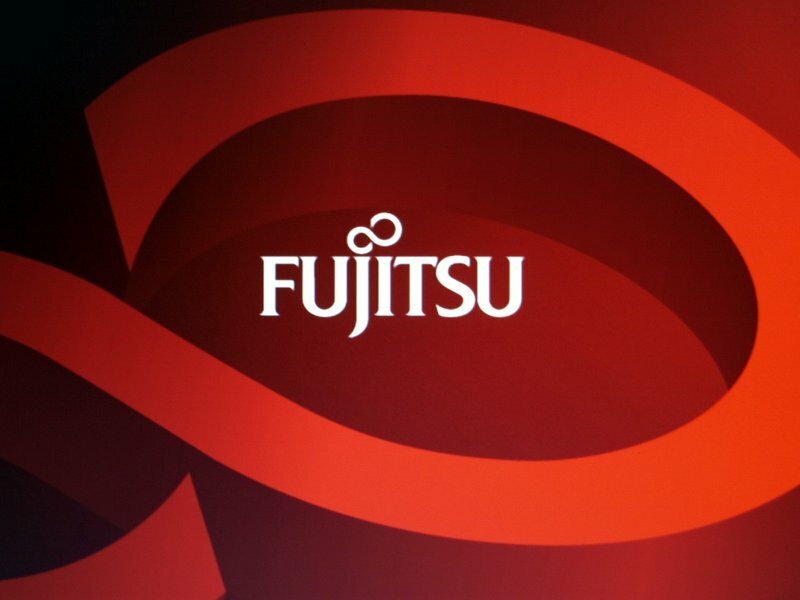 Fujitsu hasn't even thought about a recovery possibly from the hard disk or a software supported recovery creation of bootable recovery data from an own copy. The good thing about it: Bloatware hasn't been installed, either. One striking change to the 15.6 inch Pi 3560 is visible right away: The Pi 3660 has a separate numerical block. Above it, there are four keys marked from A1 to A4 that start the following applications in the prototype: Internet browser (A1), Windows Live Messenger (A2), Skype (A3) and Windows Media Center (A4). We couldn't find out if and how these functions can be defined by the user. Important functions, e.g. the wireless modules, display brightness, volume, etc can be controlled via FN key combinations with optical feedback on the screen, whereas further hotkeys or even own multimedia control elements have been omitted. Also, there is only displayed feedback when the caps lock key is triggered and you have to live without dedicated Status LEDs. In return, the splash water protection and the standard layout are to be mentioned as positive. As not otherwise to be expected from a devices of this size category, the 3660 has comfortably sized keys overall and a two-rowed return key so that you can touch type without mistakes right away. The fact that our prototype has an American key lettering is unimportant for touch typing after changing the keyboard driver. Even the keyboard's good mechanical traits, noticeable feedback and rather slow stroke length add to the typing comfort. Besides that, the matt, pleasant feel of the surface, the stable substructure and the quiet sound at use are agreeable. We find a standard touchpad without any special feature in the Amilo Pi 3660. 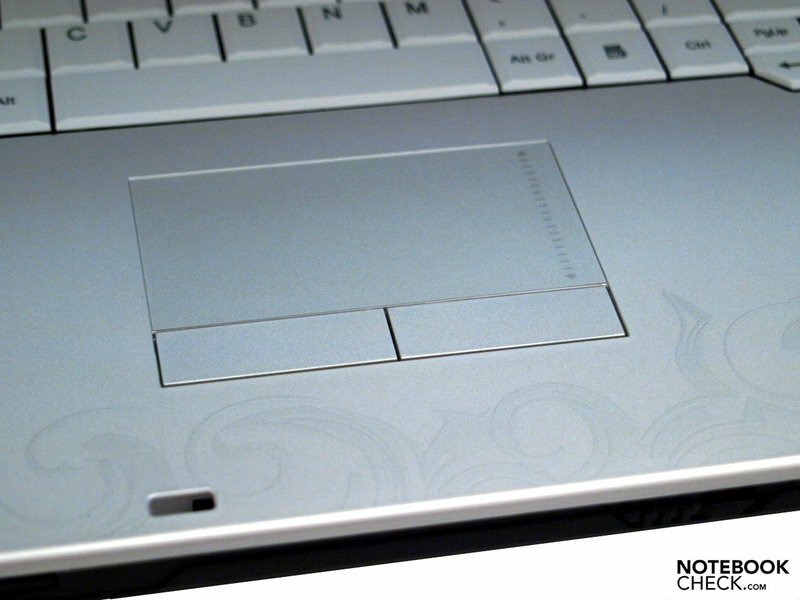 The touchpad surface has been slightly roughened but remains smooth and therefore doesn't have any optimal gliding characteristics. You have to be satisfied without multi-touch gestures but an optically, even if not contrast rich, marked scroll area simplifies vertical scrolling. The high-gloss buttons prove to be not very pleasant to touch. They have a fairly short stroke length and respond over the whole extent consistently. The HD+ display with an 18.4 inch diagonal and LED backlight, a Samsung SEC314B, has a maximum resolution of 1680x945 pixels in a cinematic-friendly widescreen format. On the one hand, the Pi 3660 is perfect for rendering movies with that. On the other, it's unfortunate that you don't have enough pixels in the height, despite the large width, to display an image completely, for example, in 1280x1024 pixels (the usual, used for a long time 4:3 format) or to execute benchmarks in this standard resolution without connecting an external monitor. BrilliantView Technology is used for the display. In plain English: The display has a glossy surface and isn't anti-reflective, which verifies the orientation on the consumer end market. The display's assessments aren't very impressive on total. We measured a good maximum brightness of 258 cd/m2 in the display's center sector and could record a still good average rate of 201 cd/m2 but the brightness is quite unevenly distributed with an illumination of only 65.4% and a low 168.7 cd/m2 in the lower right area. A calculated contrast ratio of merely 1:147 results from the fairly high black value of 1.75 cd/m2 together with the maximum brightness in the center image area. You can even see slight shadowing in the lower right corner on a displayed white background. Black is difficult to judge due to the reflections in the surroundings; white is subjectively alright. Generally, the color representation is overall good but not overwhelming. The Pi3660 can't be recommended for outdoor use because of its average brightness and reflective surface. You even have to live with more or less intense reflections indoors in adverse incident light, which excludes a permanent professional use. 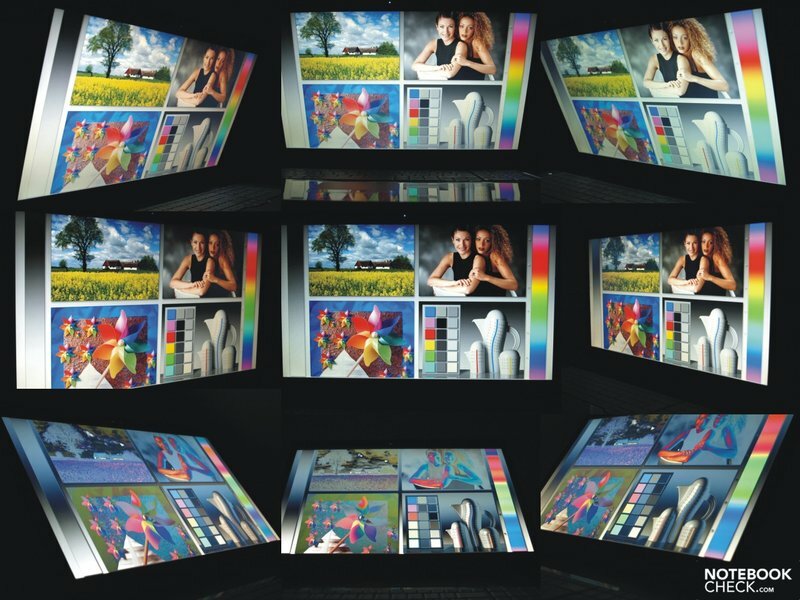 You could summarize it as a typical notebook display of the consumer end market: Vertically, the stable viewing angles are as usual tight, whereas the content dims quickly or inverts and which results in color changes. The content stay stable longer horizontally, but the reflections are enhanced at flatter viewing angles. The single models can be equipped completely differently in terms of processor. 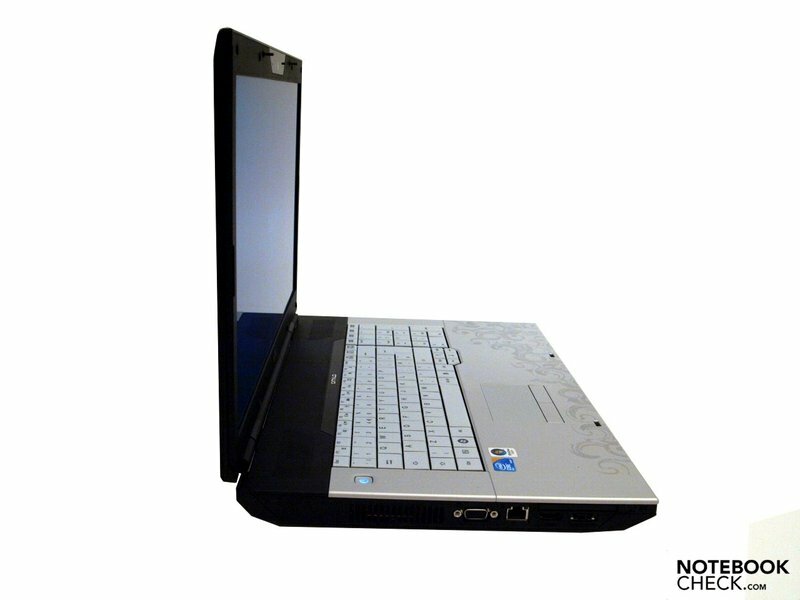 In any case, a dual-core process from Intel is built-in; in our case an Intel Core 2 Duo T6600. 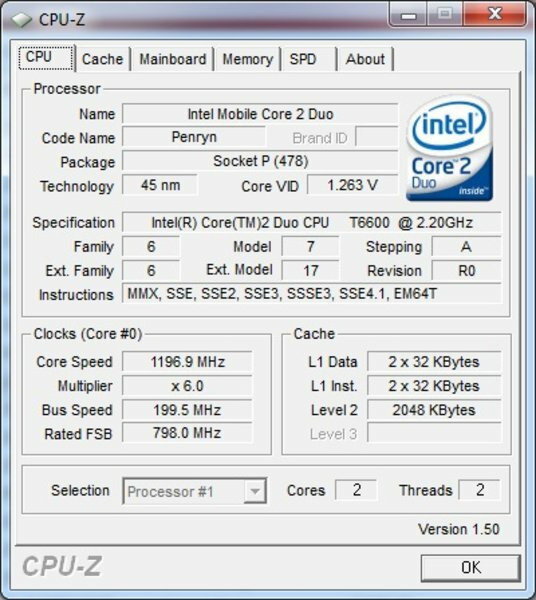 The CPU manufactured in a 45nm process under the name "Penryn" has a clock rate of 2.2 GHz, a 2 MB level 2 cache and a 800 MHz Frontsidebus. 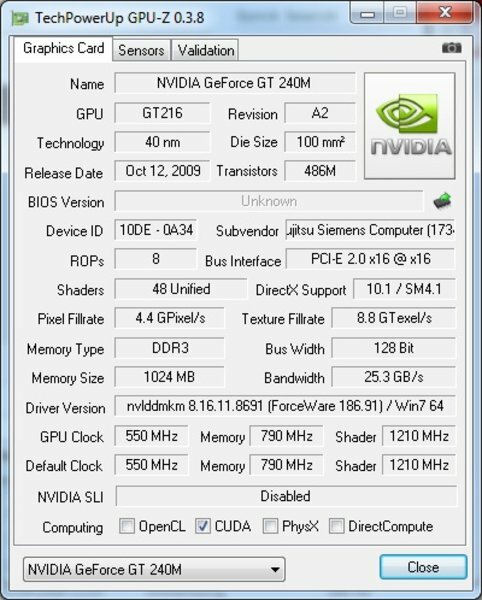 A Geforce GT 240M from Nvidia takes care of graphic issues in all models. It has a one gigabyte dedicated video memory and, depending on the RAM configuration, can borrow up to 4606 MB shared memory from the main memory (2798 MB with 4 GB RAM). The GPU processors can be used for other applications (video coding, physical effects, etc.) due to CUDA, DirectX Comput, OpenCL and PhysX support and unburden the CPU in these tasks. 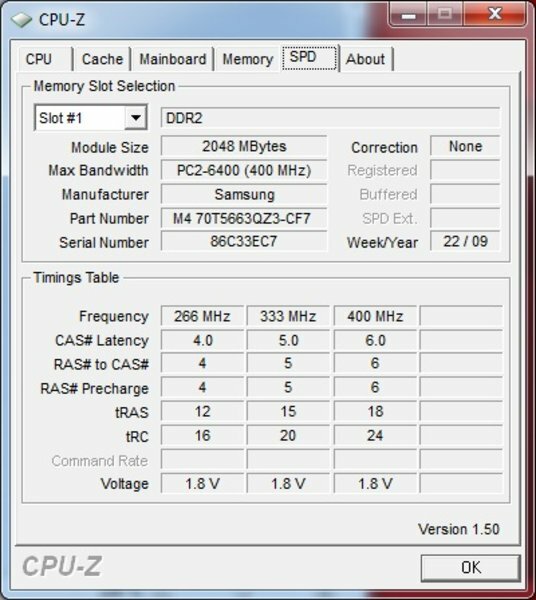 Our GT 240M was equipped with a DDR2 memory, according to EverestReport V5.30. 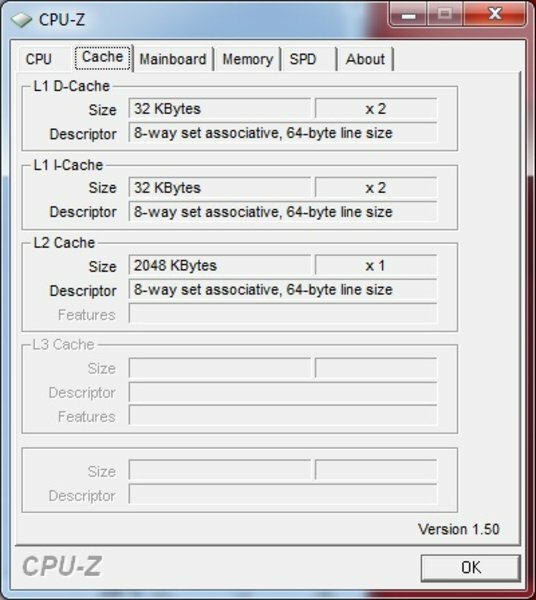 But the 0.3.8 version of GPU-z indicates DDR3 as the graphic memory type. Fujitsu's data sheet states 1 GB VRAM without further specifications. Theoretically, the GT 240M is to be placed in the upper middle class between the Geforce GT 130M and the time-honored 9700M GTS. More interesting is a comparison with ATI's competitor card, the Radeon HD 4650. We'll show you how the result turns out in practice with the benchmark rating and the gaming performance shortly. The prototype is joined by a four gigabyte main memory, divided into two two GB DDR2 bars. Thus, both RAM slots are occupied and at least one of them is obsolete. The PM45 chip set supports a maximum of eight gigabyte RAM. Because Fujitsu delivers the Pi 3560 with a preinstalled 64 bit operating system, you don't have to worry about the operating system support. 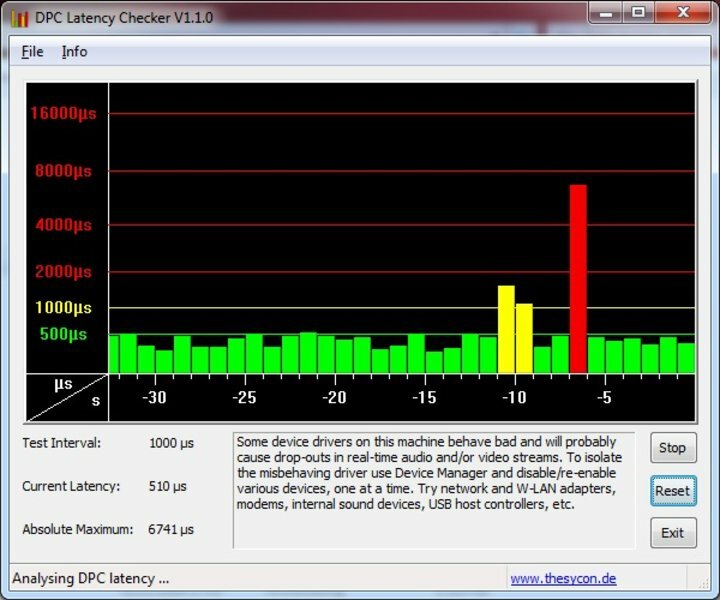 We also checked the latencies with the DPC Latency Checker tool. Most of these stayed within a green field but every now and again shot up to almost 7000µs. 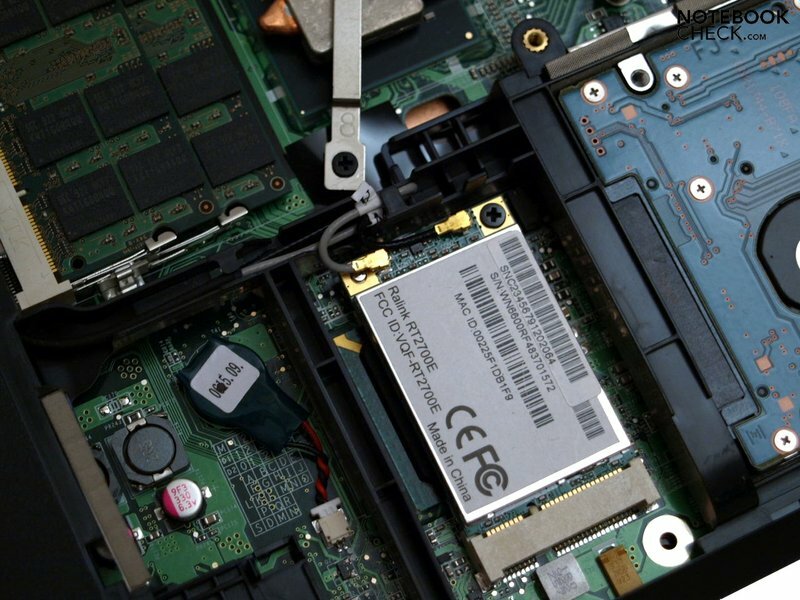 To make sure that no problems turn up when connecting a specific external device, the device in question should be tested directly on the notebook. In most cases, the latencies can be brought down to a constant low level by deactivating specific drivers. As expected, the application and graphic performance correlates to those of the smaller Pi 3560, apart from slight fluctuations. So you also speak of a good applications and graphic performance here. The precise rates can be seen on the chart below. 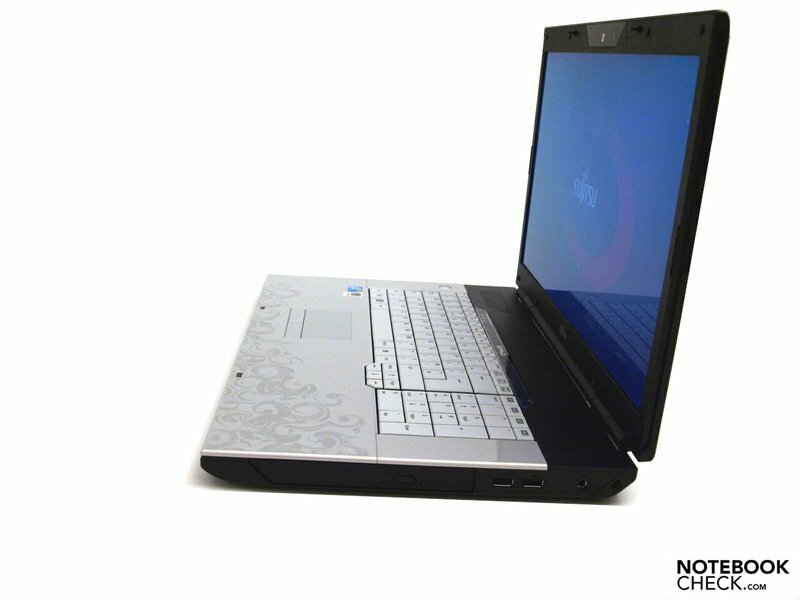 We picked Acer's Aspire 8935G (Intel Core 2 Quad Q9000, ATI Mobility Radeon 4670, 4GB RAM, 32-Bit Vista) in order to put the notebook in relationship to competitors of the same size. 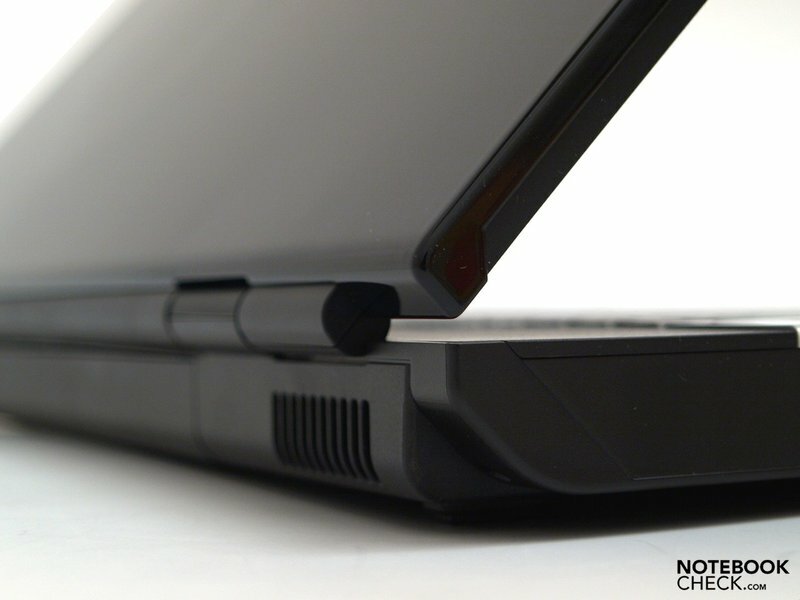 The Acer 8935G has a clear lead in applications that can use the advantage of quad-core CPUs, i.e. 75% in Cinebench's multi-rendering. In return, it's only +20% for the Aspire in the Cinebench Single Rendering test and the Cinebench Shading test. The Aspire has the smallest lead in the 3DMark01 and 3DMark06 tests with 10%. It is +30% in the overall score of 3DMark Vantage, compared to the Pi3560's rates without PhysX and only 17% more with PhysX. 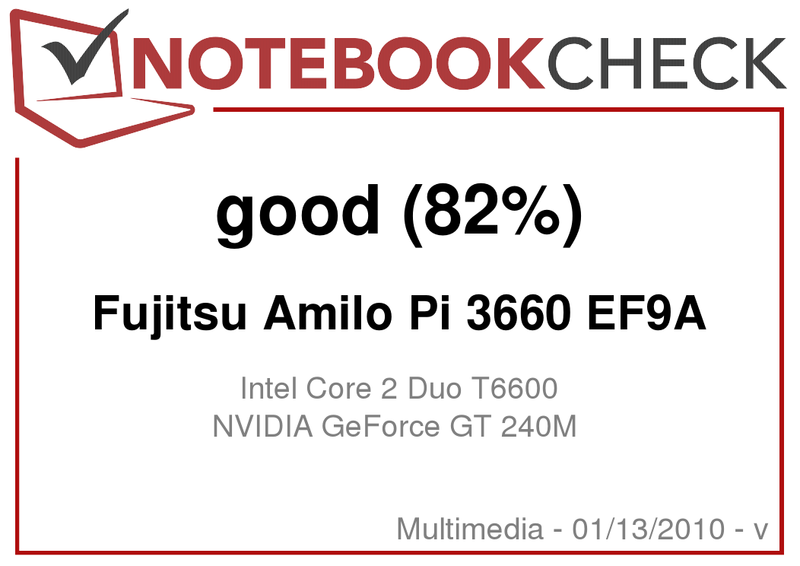 It remained, regardless of PhysX, at +23% for the Aspire in the GPU score, whilst the percentage for the Fujitsu notebook improved in the CPU score with PhysX to +56% (+90% for the Aspire without Nvidia card's PhysX in the Pi 3660). The only thing left is the 3DMark06 CPU rate, where the Aspire surpasses the Amilo Pi 3660 by 55%. It's interesting to see that the graphic card in battery mode is clocked down, though. 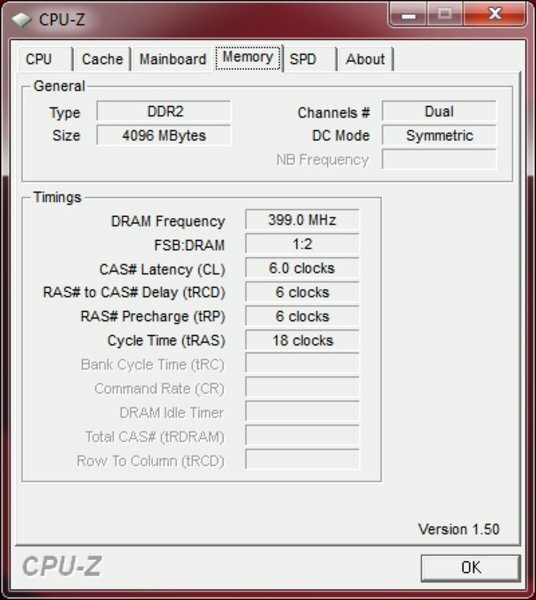 Thus, it only achieves 405 MHz (Core), 324 MHz (Memory) and 810 MHz (Shader) in battery mode and you get a performance boost of 69%, for example in the 3DMark05 test, just by connecting it to the mains. 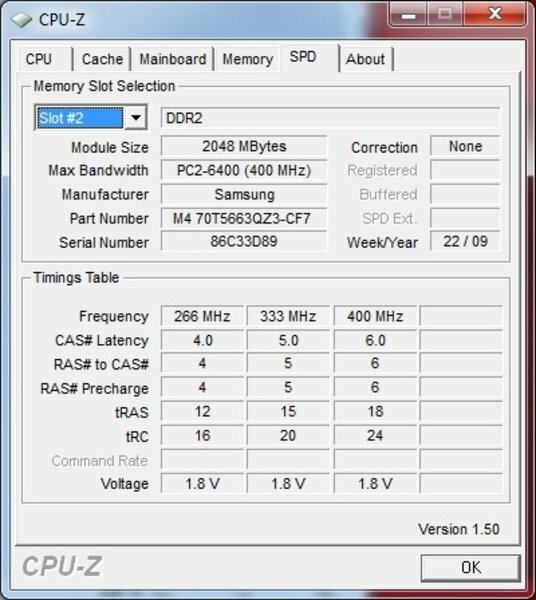 There is even no difference in the mass memory configuration to the Pi3560. 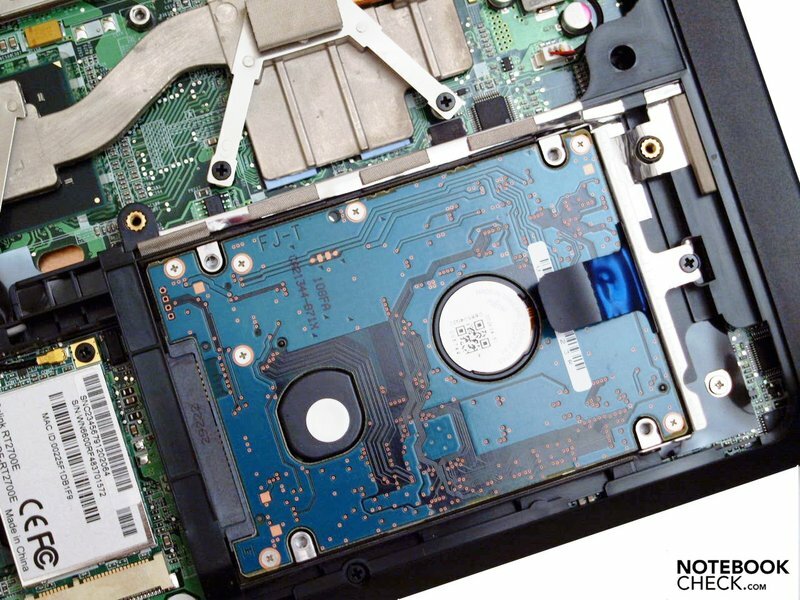 The built-in hard disk is self-made. To be more precise, it's a FUJITSU MHZ2320BH G2. It does its job with 5400 revolutions per minute and primarily bids a lot of storage for user data, such as pictures, music and documents, with a gross capacity of 320 gigabytes. A DVD drive from TSSTcorp, a CDDVDW TS-L633A, was built into the prototype. You can select a BluRay drive for a surcharge as an alternative. The Geforce GT 240M also promises good gaming results. All results of our gaming tests can be found in the column "Computer Games on Laptop Graphic Cards". Older games that don't have a very high graphic demand, e.g. Doom3, Quake3 and F.E.A.R. aren't a problem even in a high resolution and detail settings. The graphic requirements for present 3-D-biased games, e.g. Crysis, must be reduced. 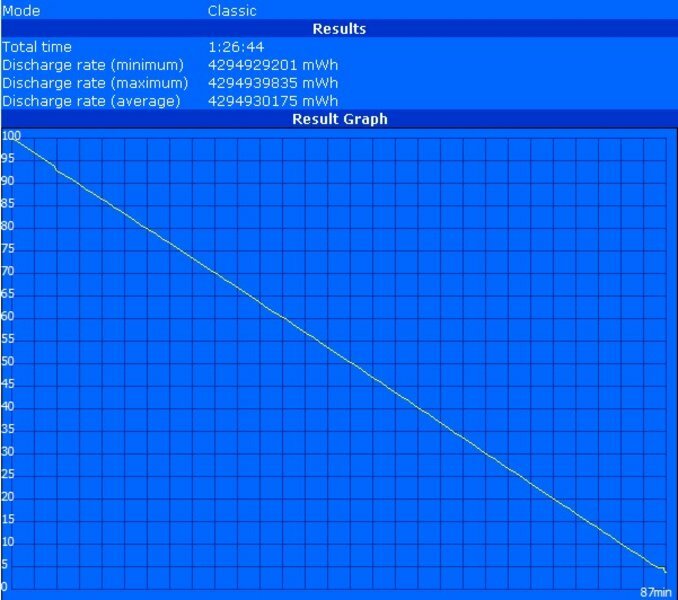 We chose Dirt2 for a random test and recorded the achieved frame rates with the Fraps tool. You can enjoy a smooth game run with an average frame rate of 44 fps in a low resolution of 800x600 pixels and low graphic settings. It's an average of 42 fps in 1024x768 and medium details. Finally, the refresh rate sinks to an average of 26 fps in high details, where the Geforce GT 240M is slightly under the limits of nonstop smooth playability. The Pi 3660 is very audible under full load with 37.4 dB(A), but because of the low frequency and steady soundscape you don't perceive the noise level as unpleasant. It is a minimum of 31.2 dB(A) in idle mode. 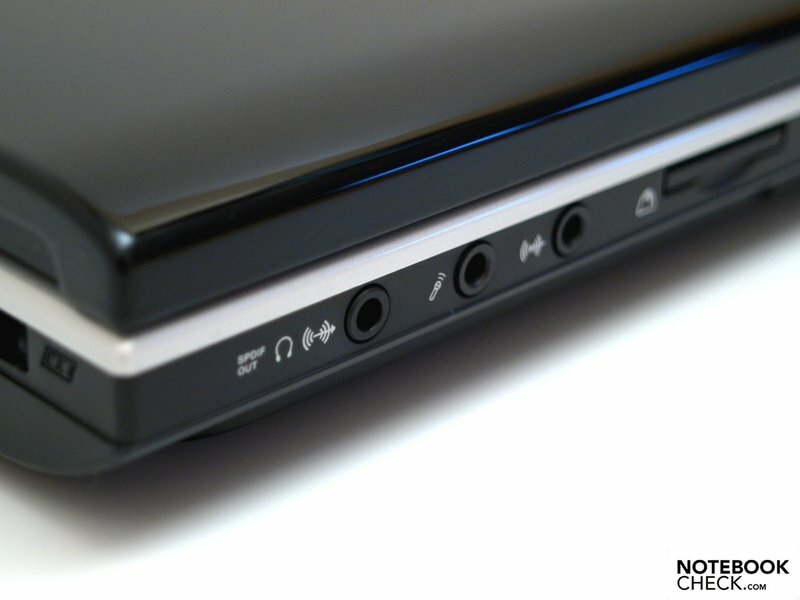 Hard disk accessing is only audible when listening closely with 32.1 dB(A). 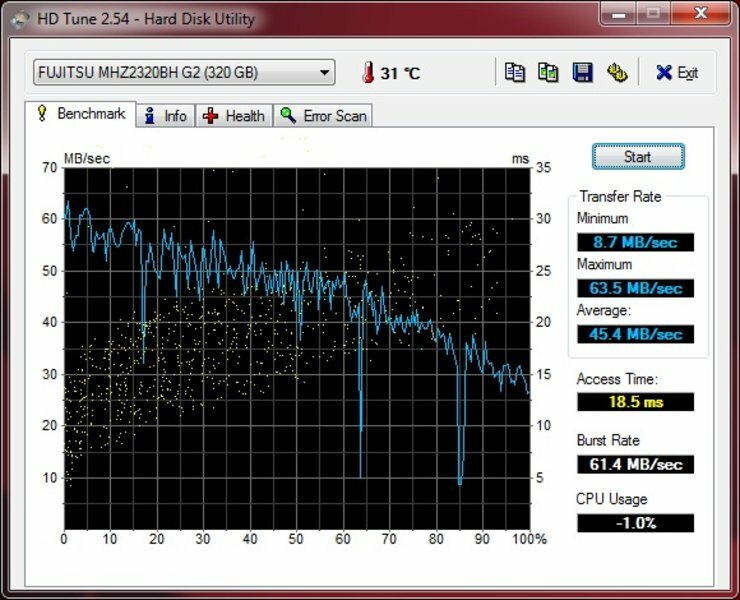 Even the DVD drive stays within limits when movies are watched with 36.8 dB(A). The upper side temperatures under both full and low load always stay within a green field. The maximum rates were measured on the bottom and were 38.9 degrees Celsius in the louver's area in a load scene and a whole 39.2 degrees below the touchpad in idle mode. However, the size and weight already more or less exclude a use on the lap so that this isn't necessarily important for the practice. The loudspeakers have a very prevalent position with their place above the keyboard's left and right. They sound quite tinny and, because a subwoofer hasn't been built-in, lack bass. You would also expect a greater maximum volume. 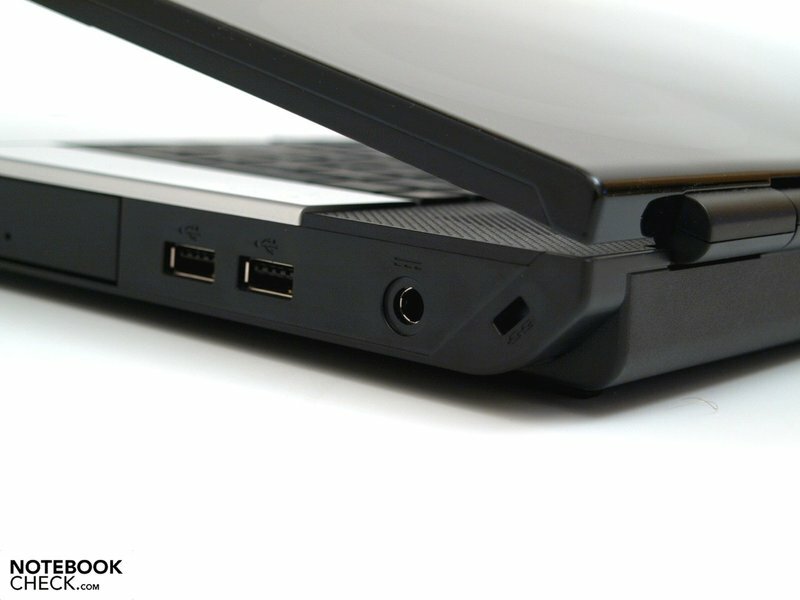 For this, the notebook has a headphone socket that, according to the manufacturer, supports S/PDIF. You can read documents for a maximum of almost three and three-quarters of an hour in energy saving mode, with minimum brightness and disabled wireless modules with the included 6 cell battery with a capacity of 54 Wh (11.1V, 4800mAh). We established this value with the BatteryEater Reader's Test tool. Only one and a quarter hour of main independent working is possible under full load, measured with the Classic Test of the same tool. The battery life will be between both these extreme values in practice. Representative of practical use, we can record about two hours for internet applications via WLAN in maximum energy savings settings and good brightness, and about one and a half hours for DVD rendering with maximum brightness and the "High Performance" energy profile. Thus, it'll get tight for an average Hollywood movie. Despite the same interior components, the PI 3660 is surpassed by its smaller colleagues of the P series and this by 11% (min. ), 18% max. ), 29% (WLAN) and 39% (DVD). 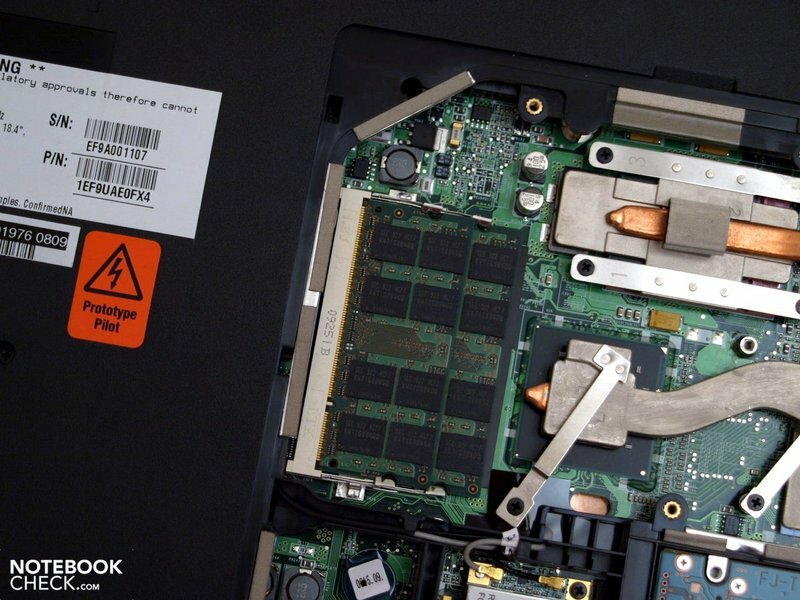 Once again, in comparison to the Acer Aspire 8935G in the performance field cited, a major advantage is shown for the Aspire, which starts with a bigger 68 Wh battery, though. In detail, we established +39% (min. 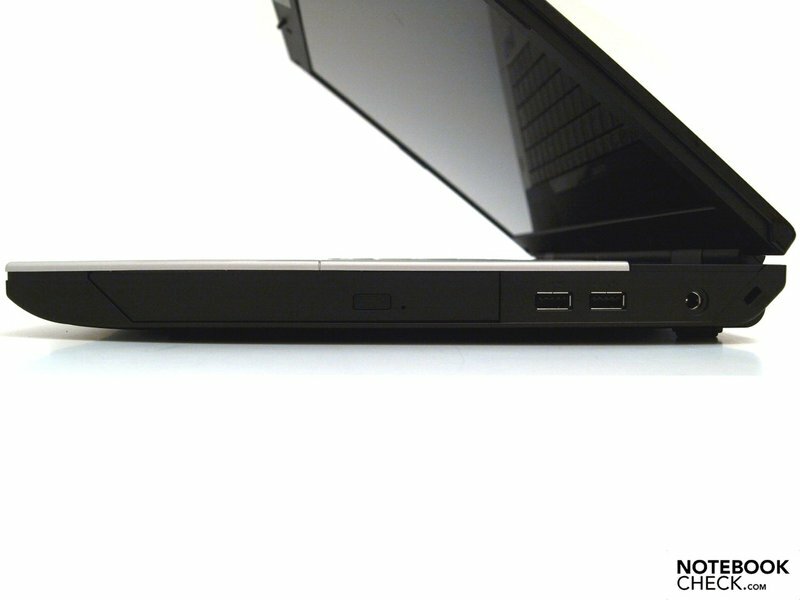 ), +80% (WLAN), +50% (DVD) for Acer's notebook. It's a +69% for the Fujitsu laptop merely under full load operation (minimum runtime), where the Aspire surprisingly only achieves 54 minutes. You'd expect a similar power consumption as the smaller Pi 3560 with the same inner components. Interestingly, the Pi 3660 needs about 18 - 34% more energy in idle mode. The whole thing relativates itself in use under load with a difference of 4-5%. The reason is soon found: The Pi 3560's screen isn't only smaller but also darker. Also to be noted is that it's a DTR notebook and therefore less emphasis has been placed on mobility. Besides, an attractive graphic performance for multimedia use had the priority. So, it's not really surprising that there hasn't been any particularly energy saving components selected. 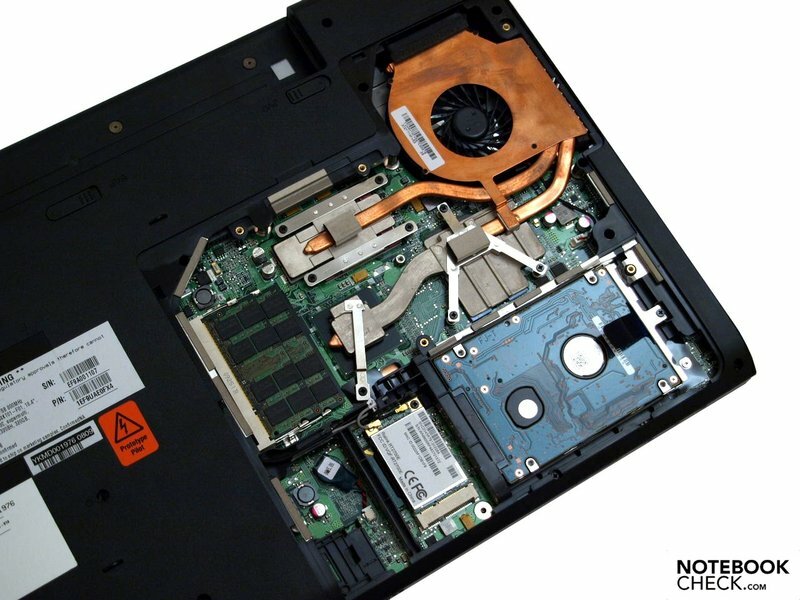 The built-in CPU, a Core 2 Duo T6600, needs a large amount of energy with a Thermal Design Power of up to 35 watts - compared to the correlating Core 2 Duo Pxxx processors that only consume 25 watts, these models save quite a bit of electricity. Even the dedicated graphic card, the Geforce GT 240M needs more electricity than, for instance, a more inefficient integrated graphic chip set. However, it's clocked down in battery mode. 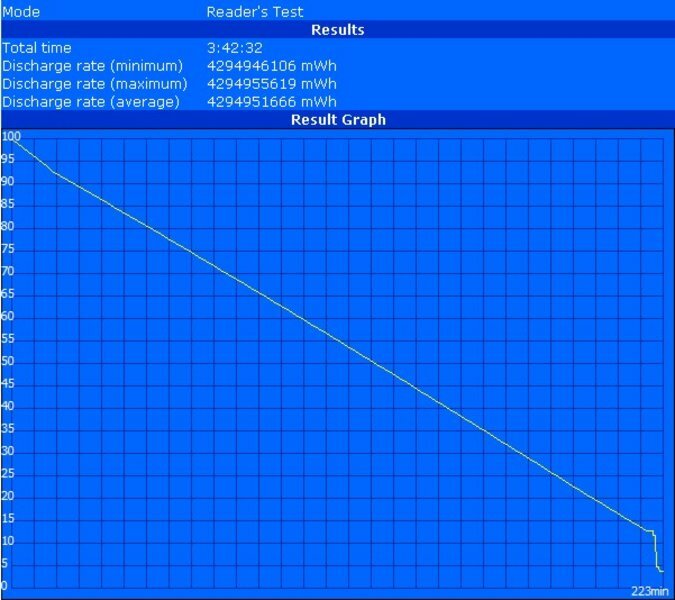 The Amilo Pi 3660 needs a maximum of 74.2 watts under load. It's still a minimum of 14.4 watts. Fujitsu offers a low-priced home entertainer in a DTR size with the Amilo Pi 3660. Fairly efficient components are found in the elegant and apparently stable apparel. The prototype showed a good application and graphic performance. All common office applications and video rendering ran smoothly. It manages image and video editing tasks just as well and present 3D games are possible with up to medium settings, depending on their requirements. Basically a complete offer at a fair price. 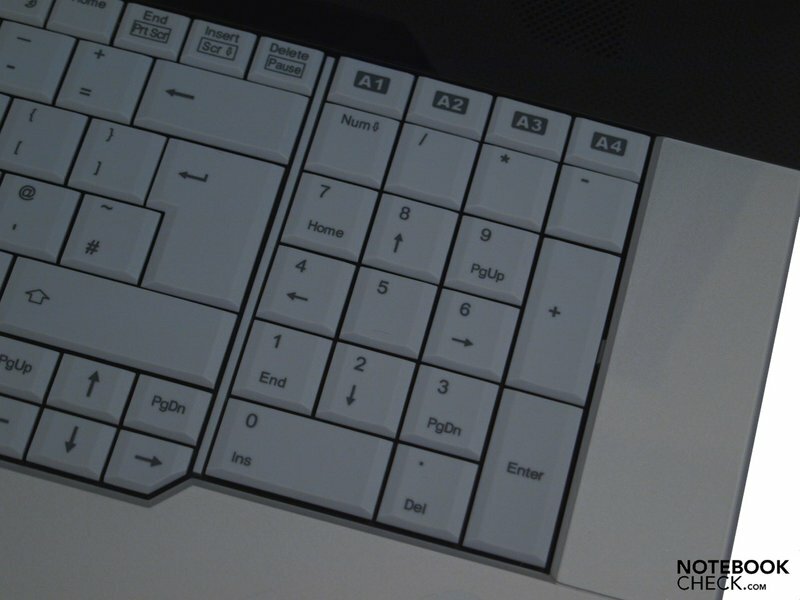 The comfortable keyboard with a separate numerical block is appealing. The given connectivity fit well to the conceived field of multimedia use. However, lefties won't be amused by the port distribution. Typical DTR notebooks don't really encourage frequent transportation already because of their size and weight. Additionally, the display isn't very suitable for outdoor use with its reflective surface and equally isn't recommendable for professional permanent use. In return, it has a high resolution of 1680x945 pixels in a cinematic 16:9 format. The battery life is, as expected, also quite short. Price conscious consumers can definitely put the Amilo Pi 3660 on their shortlist. Its configuration is perfectly tailored for the designed application field "home cinema" for not quite 800 euro. Multimedia applications and games, depending on the requirements, aren't a problem. 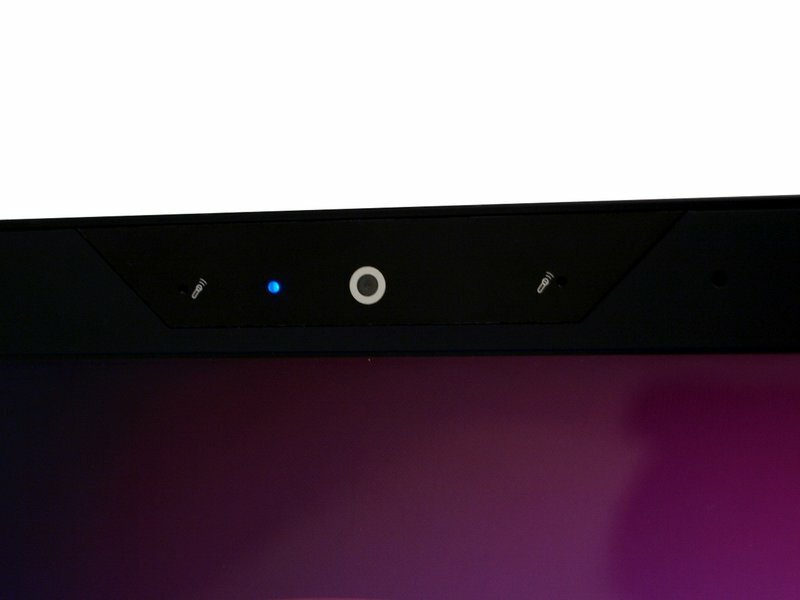 It has certainly not been conceived as a gaming machine or for professional graphic use. 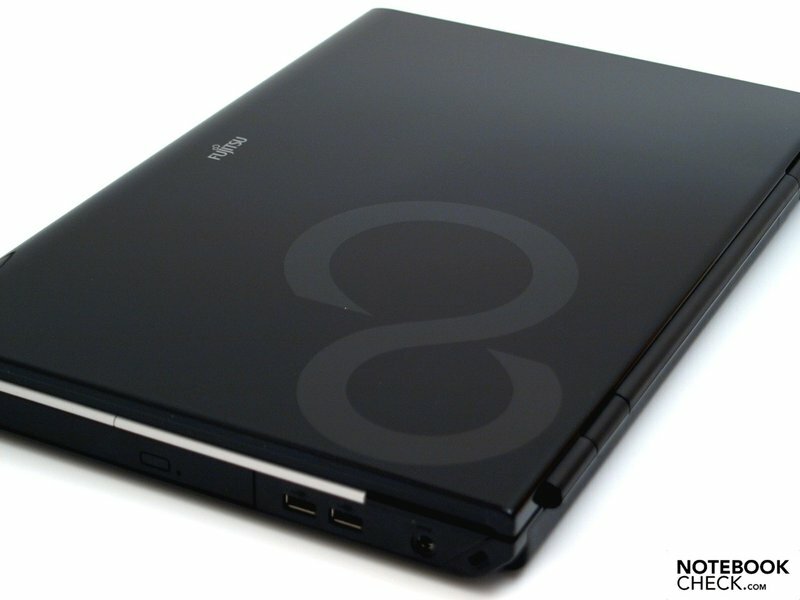 Comparable 18.4 inch notebooks from competitors are usually a bit more expensive but also bid more performance. That the Pi 3660's battery runtime is partly considerably lower than that of the smaller Pi 3560, while it is equal in terms of performance. 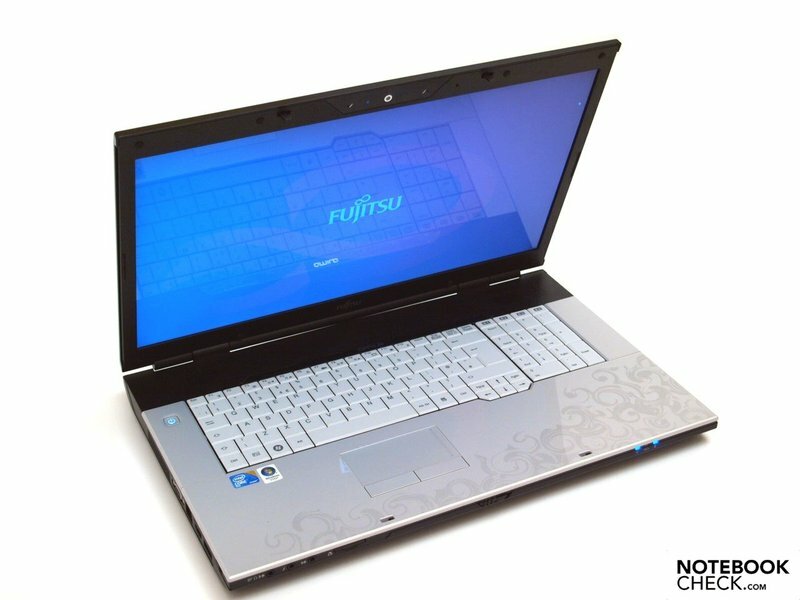 The Fujitsu Siemens has been the cheapest large size notebook (18.4 inch) in review up till now. The previously reviewed competitors bid a better performance on the whole. 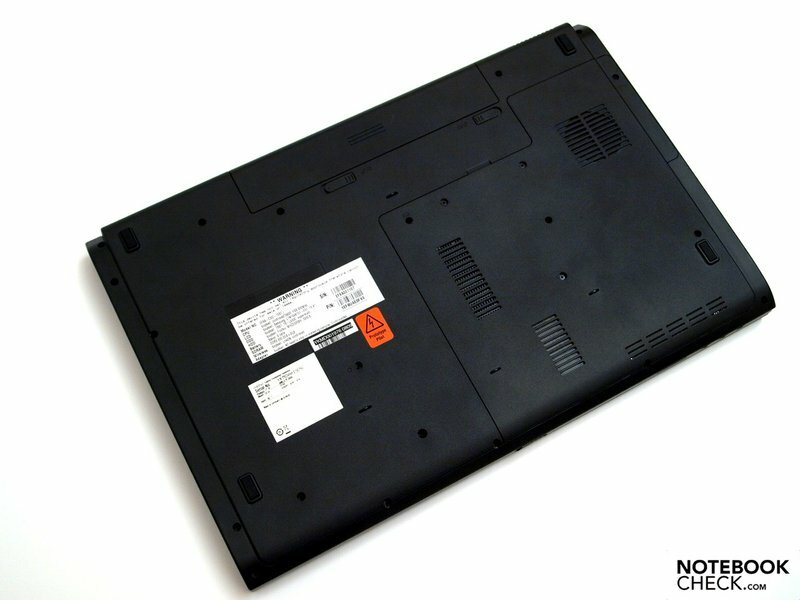 The Acer Aspire 8935G comes closest in terms of configuration.